Mom had five tablerunners in various stages of completion next to her sewing machine when she passed away--Dianne (my sister) and I had guessed that they were likely Christmas gifts for all of us kids, and after checking it out with Mom's friend Marge we were right. So I finished all five tablerunners. Oddly, I don't seem to have taken pictures of them, although I thought I had. This is the only one I have in my files. They were all Connecting Threads kits, I think. This one ended up going to Dianne. (I took my best guesses as to which one may have been destined for whom.) Miraculously, I managed to get them all done by Christmas! 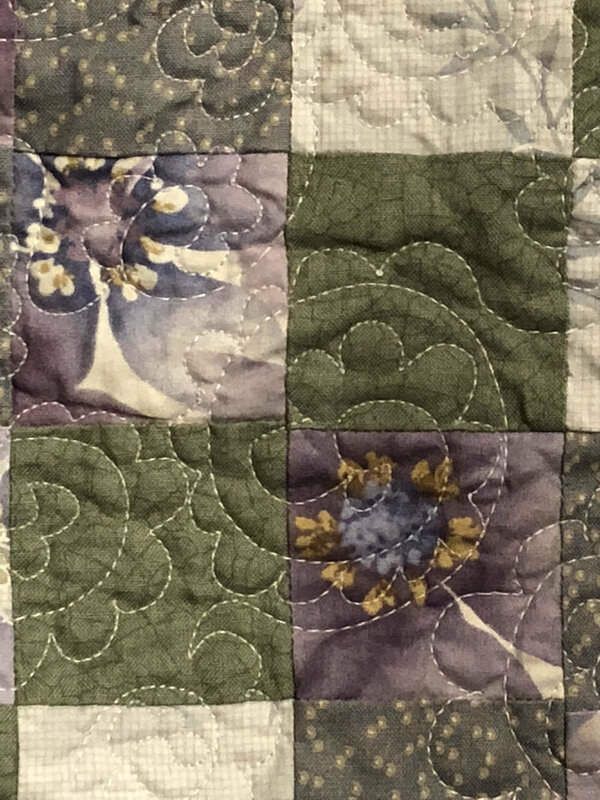 This quilt was the first momufo I finished. I chose to work on it during the memorial service as my own tribute--plus it helped me deal, to have something to focus on. 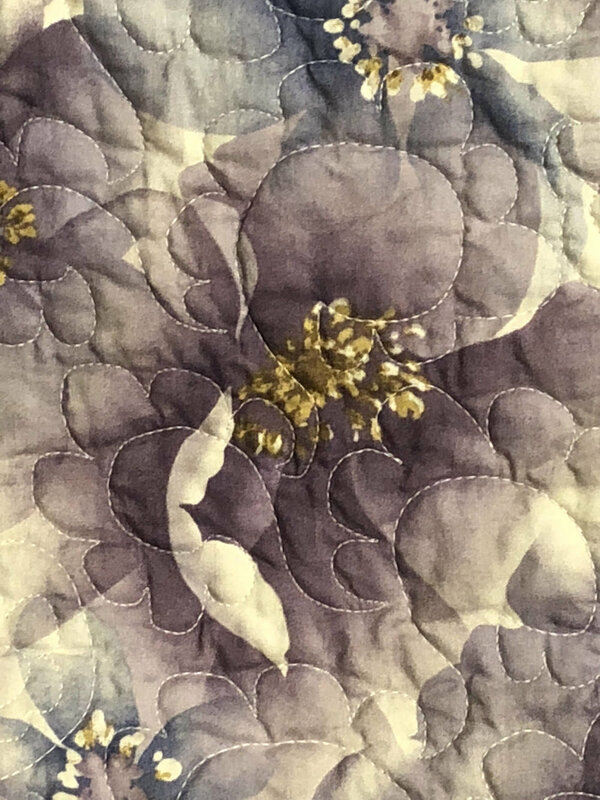 It's a pattern named "Rose Garden Anniversary Waltz." I was fortunate enough to find the pattern in Mom's stuff so I could pull all the information from it for the label. All I had to do was put the binding on. If I recall, Wendy now has this one. This next picture is the quilt label I've used on all of the momufos. The photo is one of my favorites of Mom--she's probably somewhere around 19 or 20, wearing a poodle skirt and sitting on the grass. I did some photo-editing to it ("posterized") and it works beautifully as a label. 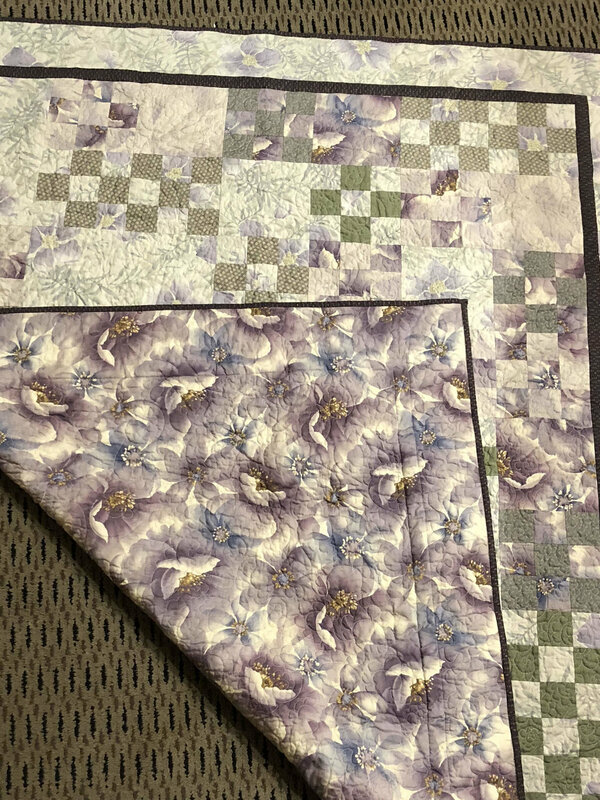 The last picture is of two quilt blocks Mom had salvaged from one of her very, very early quilts. 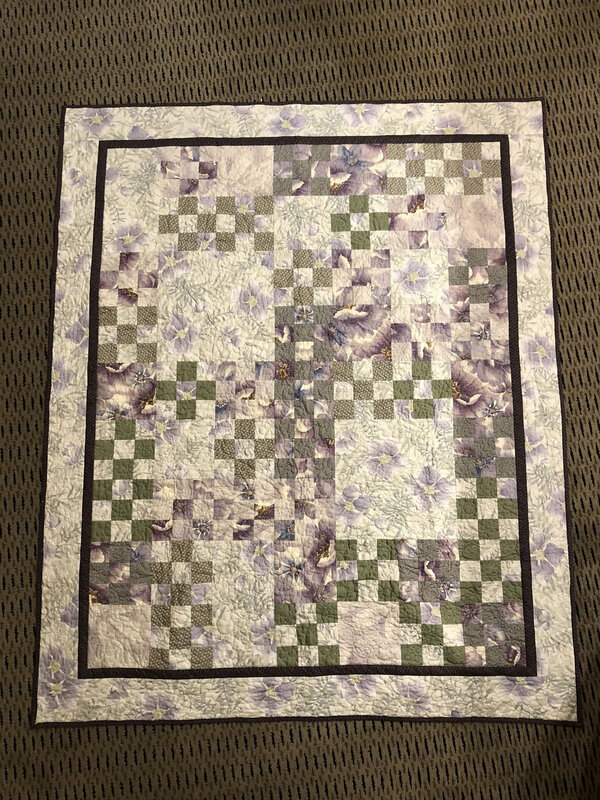 Apparently, it had been Dad's favorite quilt so when it started to disintegrate, Mom cut it a couple of the blocks out and intended to put them back into some sort of smaller wallhanging version. She had actually just talked with me about these blocks a few weeks before she died. We were in her sewing room and sorting through some stuff when we ran across them--she explained their whole backstory to me, and said, "I really want to do something with these because they remind me so much of your Dad," then proceeded to explain that The Sunbonnet Sue quilter represented Mom, and Overall Bob and the cow represented Dad. (Not that I needed her to point that out to me!) Obviously, I wasn't about to toss these blocks. After several weeks of pondering, I realized I could fix two problems at once--I'd also kept all of Mom's collectors pins from years of going to quilt shows and paid memberships to quilt museums, etc. So I put the blocks in quilting hoops and attached all of Mom's pins to hers. They're hanging on the wall in my sewing room now.